Marsh’s Chalicothere (Moropus elatus) is the best known North American chalicothere, and perhaps the most well-represented of the Chalicotheriidae as a whole. This large, browsing herbivore lived during the early Miocene of what are now the states of Nebraska and Colorado. on display at the Smithsonian Museum of Natural History (wiki). American paleontologist Othniel Marsh coined the genus name Moropus in 1877, which translates into “Slow Foot” or “Sloth Foot”. This name was inspired by the discovery of the animals’ large claws which were originally thought to have come from a type of ground sloth. The thought behind the specific name elatus is unclear, but it seems to be derived from the Latin word meaning “to carry”, “produce”, or “lift up”. Though not officially given a common name, this species will be referred to as Marsh’s Chalicothere for the purposes of this blog, which honors Othniel Marsh who described it. Marsh’s Chalicothere lived in North America during the early Miocene where it inhabited open woodland and savanna environments. 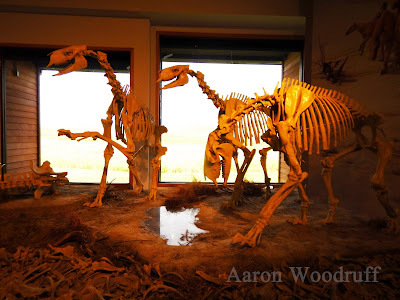 This species is particularly well-represented at the Agate Fossil Beds National Monument, an early Miocene (Arikareean) site which has produced one of the most diverse Neogene faunas in North America. National Monument Visitor Center and Museum, 2015. Because it is known from several complete or nearly complete skeletons, Marsh’s Chalicothere is the best known chalicothere from the New World. 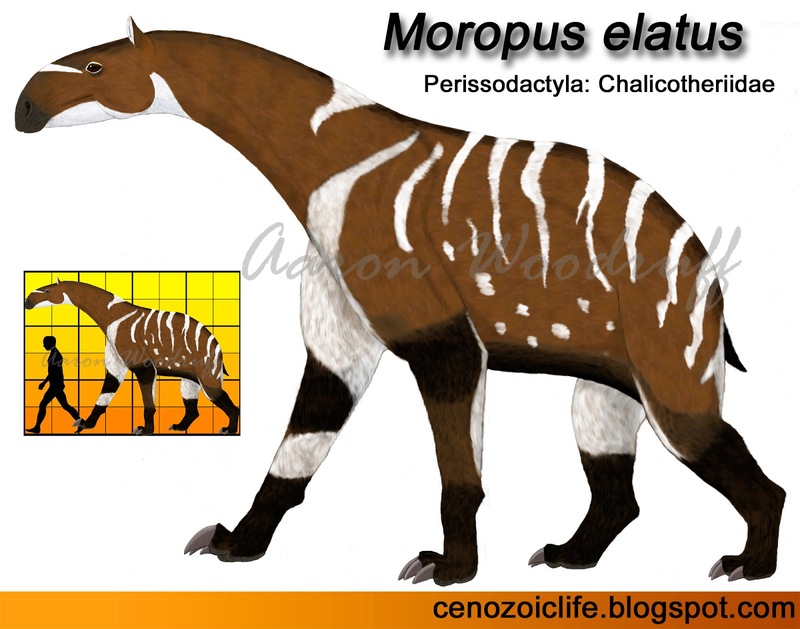 It was a large herbivore which towered over many of the early Miocene animals with which it coexisted, weighing up to a ton and standing up to 2.4m (8ft) at the shoulder. 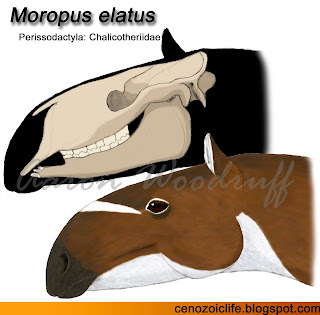 The animal had a narrow skull which was set on top of a long neck. The forelimbs were slightly longer than the hindlimbs, giving the animal a slightly lopsided appearance. The feet had three toes each, all ending in prominent claws instead of hooves. Marsh’s Chalicothere was specialized for a high-browsing lifestyle. The structure of its nasal bones suggest that they supported mobile lips adapted to grasp and break leaves and small branches into their mouths, similar to those of modern browsing rhinos. Additionally, reduced incisors and a procumbent lower jaw suggest that these animals had protrusible tongues which they would have used to bring food within range of its aforementioned lips in the manner of a giraffid or sloth. Elongated necks and forelimbs enabled a vertical reach of up to 4m when on all fours. Furthermore, the structure of the lumbar vertebrae and pelvis indicate that these animals were capable of actively rearing up on their hindlimbs, effectively increasing their vertical reach to 5m. The closest modern analogue to the feeding behavior of Marsh’s Chalicothere is the Gerenuk (Litocranius walleri), a long-limbed and long-necked African antelope adapted to browse on tree foliage unreachable to other animals its size. In addition to quadrupedal browsing, these animals frequently engage in bipedal feeding, during which they stand completely vertically. Although they are capable of balancing on their hindlimbs for extended periods, Gerenuk will more often use their forelimbs to help support themselves against overhanging branches and will even use their hooves to pull down twigs. With its clawed forearms and ability to stand erect, it is easy to imagine Marsh’s Chalicothere adopting the same behavior, essentially taking the role of a giant Gerenuk in its environment. on high foliage is a likely feeding behavior for Marsh's Chalicothere. Marsh’s Chalicothere was not built to run fast for extended periods, and thus would have been unlikely to occur on extensive open areas. Instead, it would have favored woody or bushy cover to conceal themselves where they would feed on the leaves, twigs, and bark of various trees and shrubs. For this reason, I have given my reconstruction a pelage similar to that of the modern Bushbuck (Tragelaphus scriptus) or Greater Kudu (T. strepsiceros) with vertical white stripes for concealment among the trees. 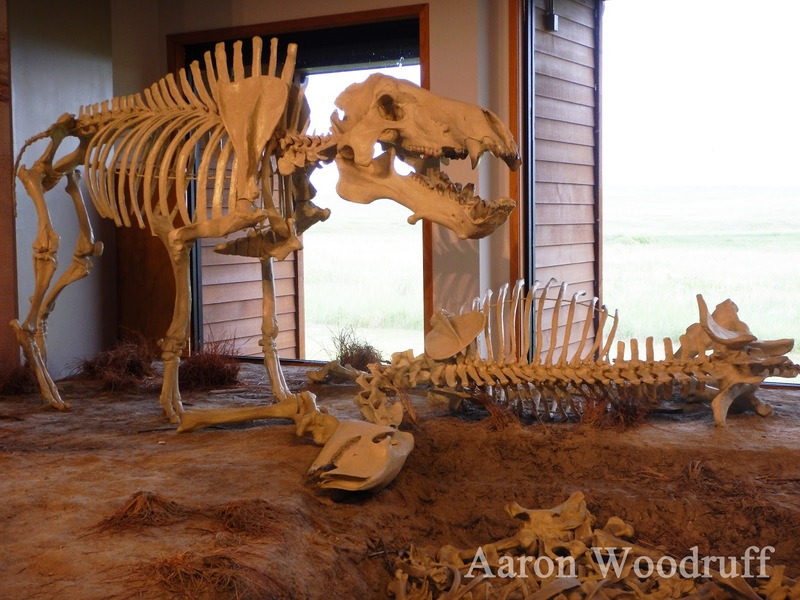 Because of their size and formidable claws, healthy adult individuals would have been virtually immune to predation to anything short of the equally massive Giant Entelodont (Daeodon shoshonensis) or Lion-sized bear-dogs of the genus Amphicyon. Direct evidence of predation on the bones of Marsh’s Chalicothere by the Giant Entelodont is known in the form of large puncture wounds which match the dimensions of the entelodont’s premolars. It should be noted, however, that these marks could have easily been left during the act of scavenging on animals which had died of other causes. Juvenile chalicotheres were far more vulnerable to attack from a broader range of predators that included several medium-sized nimravids and amphicyonids. To better protect their young it is likely that female chalicotheres aggregated in small nursery herds perhaps led by a single mature male as many modern browsing ungulates do. 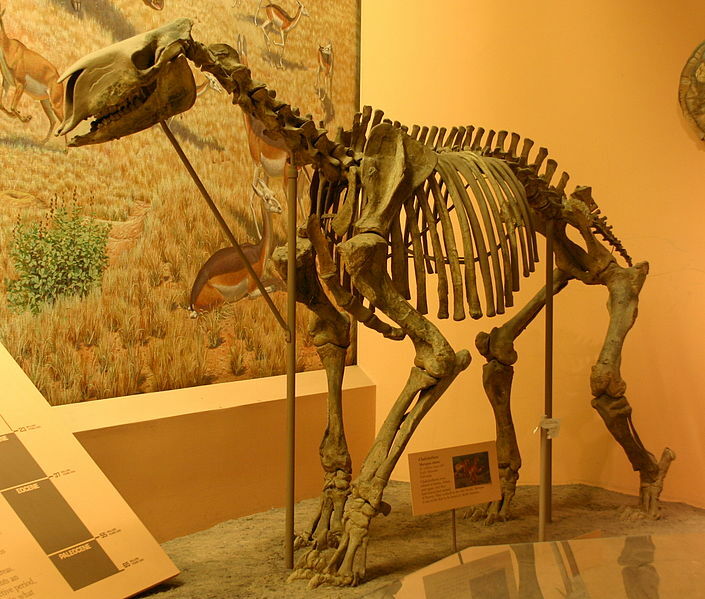 To defend themselves and their young, chalicotheres were capable of turning rapidly on their hindlimbs in order to face a potential threat and could lunge forward while kicking out with their forelimbs. contemporary predators capable of singly threatening a fully grown chalicothere. Visitor Center and Museum, 2015.